Formed when all members were attending Q.E.M.S. - a true "schoolboy band" that played only a handful of low-key youth club gigs before changing name and line up slightly when they became Thirty Frames A Second. HOWARD, Sense of Doubt and The Perfect Gift – these are just three of the songs (Fetch The) Comfy Jigsaw will be debuting on the tour. (Fetch the) Comfy Jigsaw are: Donald Skinner (drums), Matthew Lees (guitar and vocals), Andrew Baines (lead guitar) and Garry Dorrell (bass guitar). Matthew Lees and Andrew Baines on stage at Wigginton Village Hall with (Fetch) The Comfy Jigsaw in March 1981. 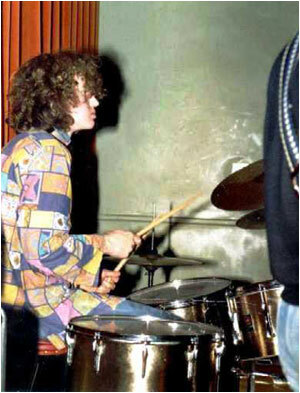 Donald Skinner playing drums with (Fetch) The Comfy Jigsaw at the Wigginton Village Hall gig. 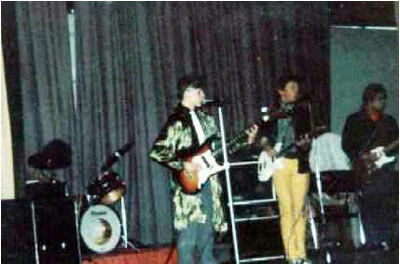 (Fetch) The Comfy Jigsaw in March 1981 playing at the QEMS School Assembly (left to right) - Donald Skinner (drums), Mark Mortimer (bass), Matthew Lees (vocals & guitar), Andrew Baines (guitar). 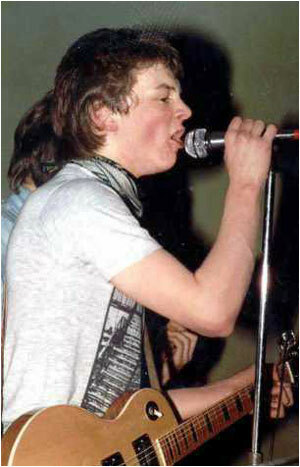 (Fetch) The Comfy Jigsaw "live" at Wood End Youth Centre in September 1981. The photo shows (left to right): Matthew Lees (guitar), Mark Mortimer (bass and on this song lead vocals! 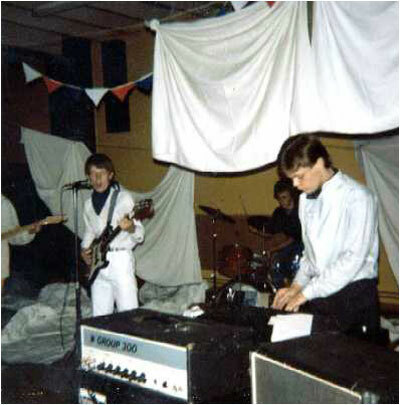 ), Donald Skinner (drums) and Andrew Baines playing keyboards (he also played guitar). Note the bed sheets that littered the "stage area"!! We decided beforehand to go all arty and strange and, inspired by Echo & The Bunnymen's then penchant for camouflage nets and army greens on their stage shows we proceeded to spend the afternoon of the gig running around the village of Wood End darting in and out of people's back gardens and stealing bed sheets from washing lines to create what you see in the photo!!!! Wonderful madness!! I am sure the villagers were wondering where all their bed sheets had gone that day! !